Hi I'm Jack. I posted this blog so everyone can see my progress as I learn, run and play AGILITY! Splash dog 02/13/11.. Dont I look so cool.. hey look at all those people taking pictures of me.. WOW I must be famous. Great run in jumpers with weaves. I earned 16 more MACH points! Well, I jumped 2 more inches.. yeah pretty cool huh! Eleven feet seven inches.. I'm the best! Splash Dog Finals on Sunday 4/19/09. Another record breaking jump for me!! ELEVEN FEET FIVE INCHES. Watch my video, I am such a crowd pleaser! 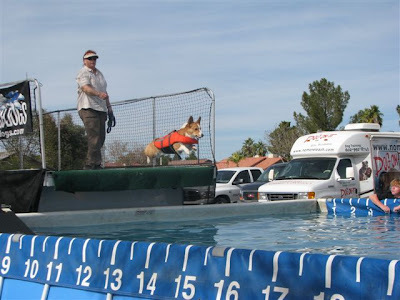 Ok, here it is, my new World Record Splash Dog Jump by breed, Pembroke Welsh Corgi, ELEVEN FEET ONE INCH. I beat my own record by ONE FOOT. Yeah ~ sing along ~ WHO LET THE DOGS OUT ~ WOOF ~ WOOF WOOF ~ WOOF WOOF ~ Check out the video. Agility trial 04/04-05. I needed two more Q's (qualifying runs) to get my next title for jumpers with weaves. Novice Agility Jumpers, NAJ. And I did it! One Q on Saturday and again on Sunday. We had a small slip up on Sunday, I did exactly what I was suppose to but Mom turned wrong and pulled me off of a jump. Its ok, I fixed it for her with a great come back. Enjoy my video, and plan on seeing more. Mom is taking an early retirement from her job. Now she can spend all day with us. Gee, I hope she has enough money for my food. We had a great time in Arizona. I decided to try "Splash Dog". 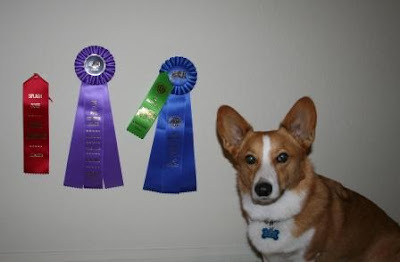 I entered the competition and broke a world record for longest jump by breed, Pembroke Welsh Corgi. The previous record was 6' 3"... I jumped 10' 1". Yeah Baby.. now thats a record!! Not too bad for a guy with six inch legs. 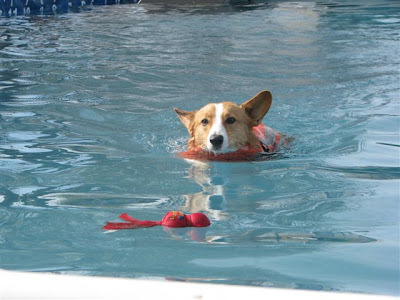 You can check out Splash Dogs on the web and see my stats. See my links. I had some great runs in agility too. It was a fun weekend. I was born in Cardington Ohio at B Country Farms 185.